Well, it’s been six months since Terry and I changed careers. And we are STILL lovin’ it. The honeymoon is over, but we are so grateful for this opportunity. The timing was PERFECT for us although we didn’t realize at the time, HOW that change would manifest itself. NOW we are shopping for a full-time RV to finalize our jobs as mobile OSHA Certified Hearing Technicians with The TK Group. As I write this entry we are at our favorite location in the Kansas City, MO area, which we have decided we like VERY MUCH. We’ve either worked or stayed in this area many times over the last six months, so we have learned where everything we need is located, enjoyed lots of GR8 Bar-Be-Que, made some friends and really feel like we are coming to our home away from home when we return. For now, our favorite crash pad is a Candlewood Suites hotel, but we are looking for a suitable MHP or RVP we can use near this area once we are RVing full-time as we work. January provided us a week long project in Oklahoma City so we visited the OKC Museum of Art to see the exhibit of Dale Chihuly. This is the 2nd time we have seen his work, and it always is impressive. We also took in a rodeo. The last week in December we spent a whole day at the National Cowboy Museum. Christmas was spent back in Arizona in our vintage travel trailer, which we left in dry storage right on the same site we camped on. Our trailer is for sale so that is nice, not having to haul it in and out of the previous storage property. 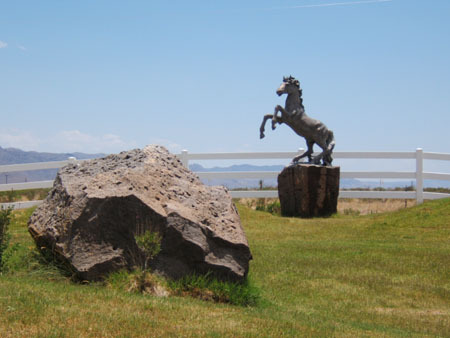 Quail Ridge RV Resort is a great RV park, with full-timers, permanent residents on their leased lots plus overnighters all comfortably on spacious lots. They often host the annual Cowboy Poetry Festival event, which is coming up in February. It’s only a 20 minute drive into Sierra Vista, Tombstone, or Patagonia from Quail Ridge. Our 2 weeks off at the end of the year included a 3500 mile round-trip from our last work location (Tulsa, Oklahoma) to Arizona, thru Kerrville, TX to visit Mom and back to Tulsa. November took us to Alabama to visit with my Dad, and we worked in Arkansas and Oklahoma. By Thanksgiving we were back in KCMO and I was able to cook a full turkey dinner with trimmings in our crock-pot. Had never done that before, and it turned out better than I expected. In October, we spent a day in Branson, Missouri where we met with Phil & Lorie, friends of ours who drove over from their new job location in St. Louis, Mo. Four years ago we met them when we both managed self storage locations in Phoenix, AZ. 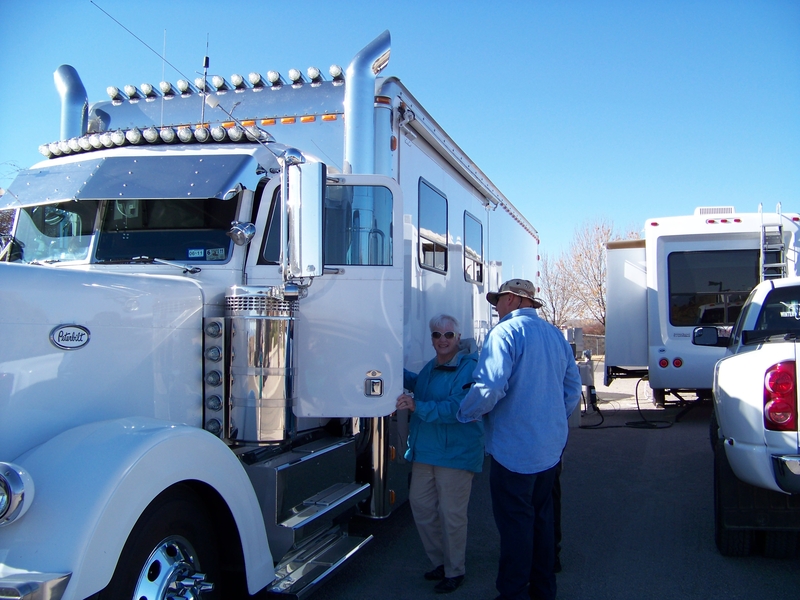 Phil & Lorie loved living in their motorhome years back, so they are looking forward to purchasing another one some day. We also enjoyed a few hours in St. Joseph, MO at the Patee House museum and Jesse James museum. September we were working in Michigan and discovered how many great RVing spots there are in that state … we never knew! Stumbling on the annual Woodward Dream Cruise was a blast from the past as we drove our Freightliner MDT along with the classic cars for a few miles. They were taking pictures of us as we were taking pictures of them, laughing all the way. What a blast that was! We crossed 2 items of our bucket list – the Henry Ford and The Ford Rogue factory tours. We also had a nice tour of the Laura Ingalls Wilder farm home in Missouri. August was HOT everywhere and Indiana and Illinois were no exception. Having acclimated to the Arizona desert, the corn fields triggered allergies that I never knew I had. Next year, I will carry Quercetin with me 24/7. I almost couldn’t get to work one day, I was so miserable. When we took off from AZ in July to take our training classes in Illinois, we crossed another item off our list … the Great Platte River Pioneer museum. You know, that HUGE bridge that crosses over both the east & west bound lanes of I-80 in Nebraska? The one everyone says “what IS that thing?” the first time they see it? Along the way, we stopped at the NRA Whittington center for a visit where Terry became a member before we left. Well, OUR thoughts certainly have. 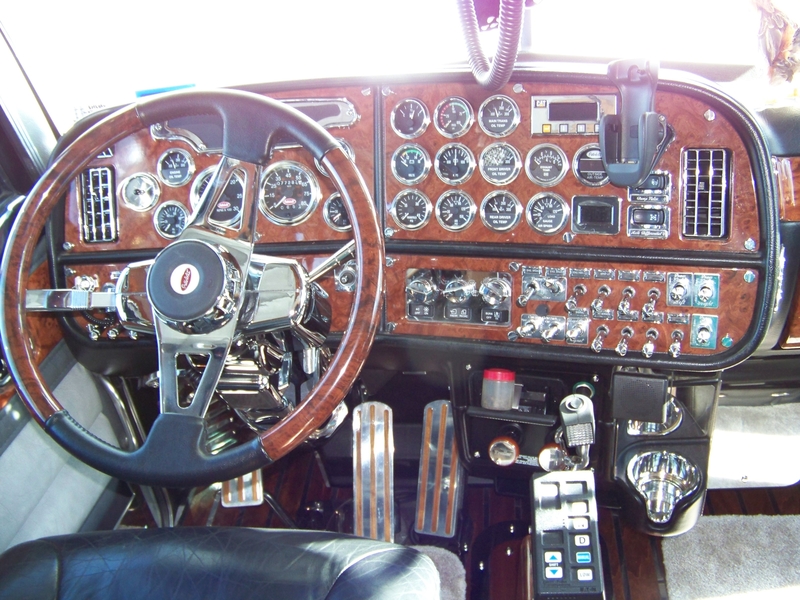 Terry’s #1 dream is to own a Pete – a Peterbuilt tractor, that is. 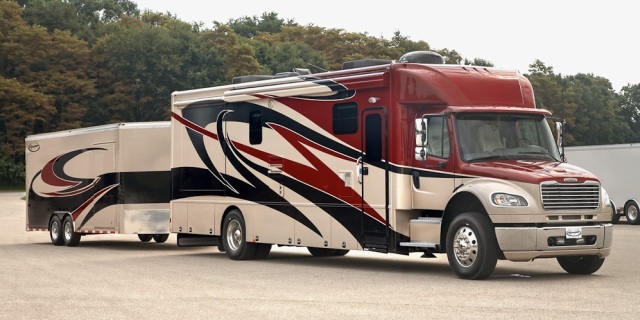 My dream is to custom design a motor home – with ALL the features we want and need, and none of the “fluff” most RV manufacturers throw in-like mirrors and toilets in a closet ! So far, our dream RV on a Peterbuilt chassis has been just that ….. a dream ….a sketched out plan in our minds for “when we hit the lottery”. Aparently, we are not the ONLY ex-truck drivers who dreamt about a Pete motorhome ! This weekend we met THE owner of OUR DREAM rig – Jim – who stayed for 1 night at Hacienda RV Park in Las Cruces, NM on his way back home to Texas. We “just happened” to be visiting my Mom who was parked at Hacienda the same weekend – also heading home to Texas! Coincidence ? We think NOT ! 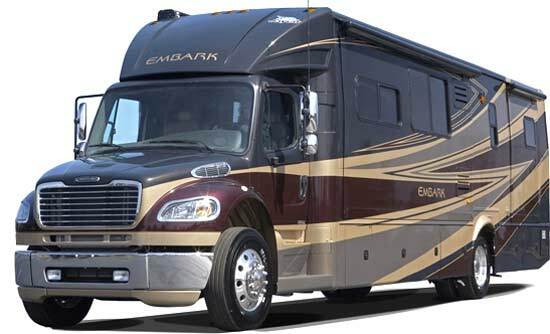 Now, what’s truly amazing is that we have been dreaming of this type of motor home for years. Having driven over the road as truck drivers, we have seen many, many types of RVs – but the majority just don’t get our hearts pounding. Custom RVs are a whole different story-and are used often by NASCAR teams to haul their equipment and drivers back and forth across the country during race season. Over the past 10 years, we’ve climbed into every custom RV we could, taken lots of pictures, talked to sales reps, and collected brochures. I subscribe to blogs, read the forums and have pictures on our vision boards. But until this weekend, we hadn’t seen “IT”, and now we have. 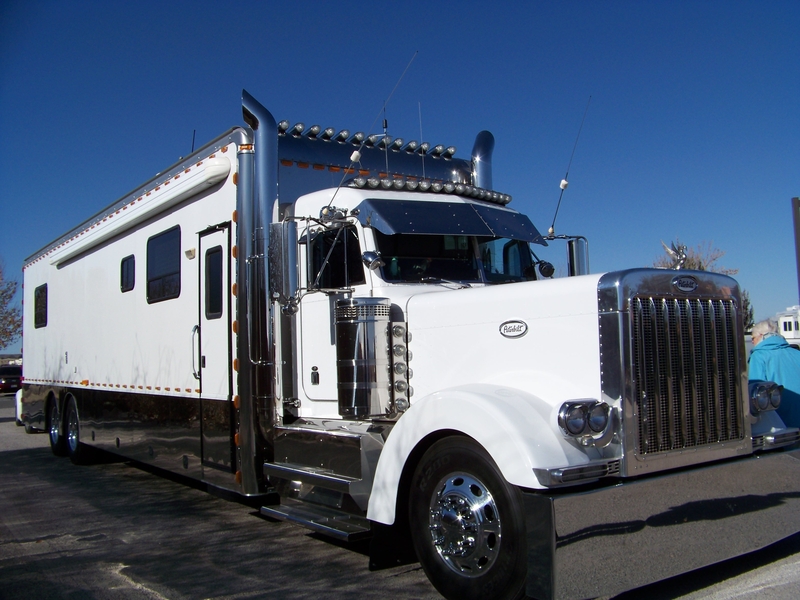 There are a small handful of custom dealers who will design a motor home to your specs – but none on a Pete chassis. Not by coincidence we meet Jim, who discovered a dealer in Indiana who DID build a custom RV on a Peterbuilt chassis. Our thoughts have become things in our lives so many times – and here’s a picture of 1 of them ! On our way home we took the scenic route back – via Hwy 80 south from I-10 thru Rodeo, NM and Portal, AZ. This beautiful rural drive takes you thru a valley hugged by the Chiricahua and Pilloncillo Mountains, where Geronimo’s tribe lived also introduced us to Rusty’s RV Ranch and Hideout Ranch, which we plan to visit more in depth. Rusty’s is a fairly new RV park just a couple miles north of Rodeo, designed by RVers with wide 200′ pull-thru spaces, some with a patio area and views to die for. 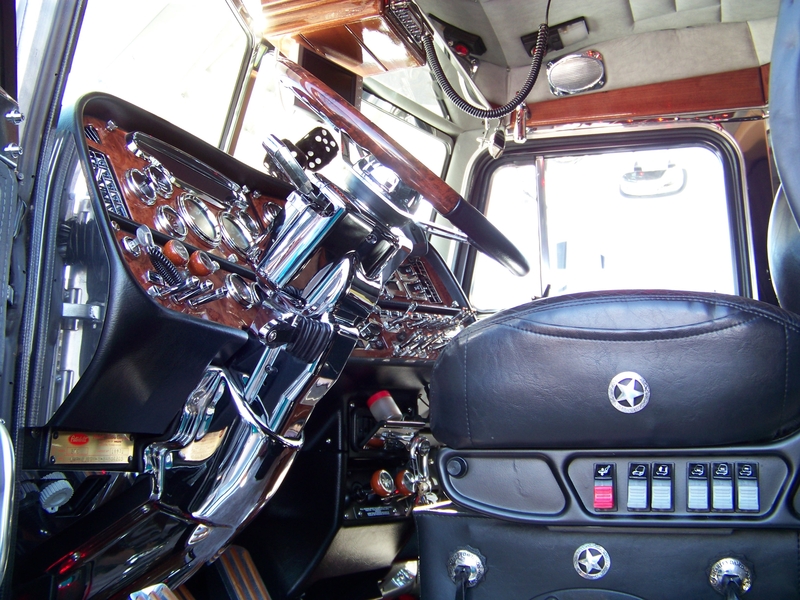 Yes, the Pete MH would fit nicely into any of Rusty’s spaces AND still have room to spare. Rusty says “many of our guests come for a day, and stay for a month” and I can see why. 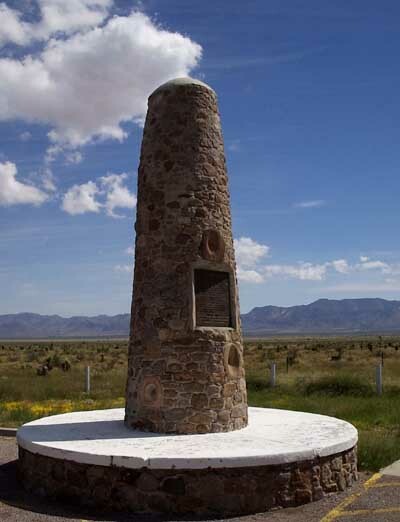 Driving through Rodeo, NM enjoying the wide open spaces and 360 degree views of mountains gave us renewed enthusiasm for the beautiful – and history-laden area of SE Arizona that we call home. Whether you travel via horse, motorcycle, RV, SUV, travel trailer, fifth-wheel or your dream motor home — or even if you are just starting your traveling dreams, be sure to put this route on your list because to us ….. The Renegade is our dream RV. Yes, we REALLY prefer the body style. We’re ex-truckers, so the front nose is more our style preference than a rolling box. With a Freightliner, Volvo or International chassis we don’t have to worry about weight – as long as it’s balanced, there is more than enough capacity than we would ever need. We’ve seen very few A’s that have all the features we’d like in a floorplan. Ideal scenario would be to have one custom built to our specs – and Renegade will do that. Renegade is the only DP manufacturer we know of that custom-builds. Quality is not cheap, but a 1/2-decent Class A DP is the same $$ or more. In our ideal life, we’d have the coach, AND pull a 12-16′ cargo trailer with a trike, BBQ grill, seasonal items that MUST be at hand (NOT in storage on the ‘tother side of the US), and if we are working at events – inventory/display cargo. We recently saw online a new Jayco Embark TB#390model -it’s a floorplan that offers the closest (so far) to our preferences in a manufactured RV by any maker. It has a bunk-bed area which could be converted to desk & laundry area. BUT- it’s 40′ long. We’d prefer 34′ MAX. If the floorplan is perfect, with a 16′ trailer, we’d be set! Now for the lotto tickets to come in! We’ll keep dreaming …. Don't just write your story - invent it!